SPECIAL VIEWER OFFER – SAVE $95.80! – a saving of $95.80! Postage and handling of $12.50 will apply. Temporary hair loss can be caused by a number of factors including stress, diet, medications, post pregnancy and menopause. Over-styling, treating or colouring hair may also cause it to become thin and increase the risk of temporary hair loss. 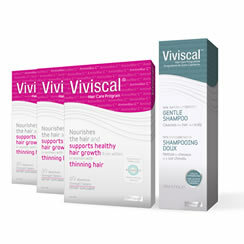 Viviscal supplements nourish the hair and support healthy hair growth from within in women with thinning hair. Viviscal supplements are scientifically formulated with the important nutrients Biotin and Zinc and the proprietary marine protein complex AminoMar C™. Viviscal supplements also contain Vitamin C, Niacin, Iron, and Millet Seed. Viviscal's efficacy is clinically trialled with research and development spanning 20 years. Viviscal Gentle Shampoo has been scientifically formulated to strengthen and gently cleanse your hair and scalp to help create the ideal environment for healthy hair growth. SLES/SLS-free for gentle effective cleansing with less lather that doesn't affect the hair's cell renewal process. Unique Multifruit extract gently exfoliates to remove dead skin cells from the scalp. Panthenol conditions the scalp and helps keep hair strong and healthy. Recommended daily intake: Take 2 tablets daily for a minimum of 3-6 months (1 in the morning and 1 in the evening taken with water after food). Thereafter, to maintain healthy hair growth take 1-2 tablets daily as required. Viviscal tablets are easy to swallow. We recommend using our Gentle Shampoo, Moisturising Conditioner, Hair Scalp and Serum and Volumising Hair Filler Fibres in conjunction with Viviscal supplements. Warning: Dietary supplements should not replace a balanced diet. Children, pregnant or breastfeeding women and those who have recently had a heart attack, surgery or major accident should not consume this product withoug medical advice. If symptoms persist consult your healthcare practitioner. Viviscal™ is a trademark of Church & Dwight Co.,Inc. Distributed by Church & Dwight (Australia) Pty Ltd.